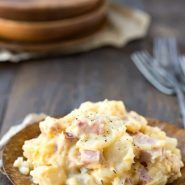 Slow Cooker Scalloped Potatoes with Ham are a yummy crock pot recipe that turns leftover ham into a whole new meal! I always like holiday dinners. I think I enjoy them as much for the tradition and nostalgia as for the food. Don’t get me wrong, though. I do love the food! Ham at Easter and at Christmas was always a tradition in my house while I was growing up. I still love having ham during the holidays. My kids aren’t huge meat-eaters, so now now I have to figure out what to do with all of the leftover ham. I always look forward to the leftovers (and not having to cook the day after the holiday). However, after a day or so of reheating the leftovers, it’s nice to turn some of the food into a whole new meal. 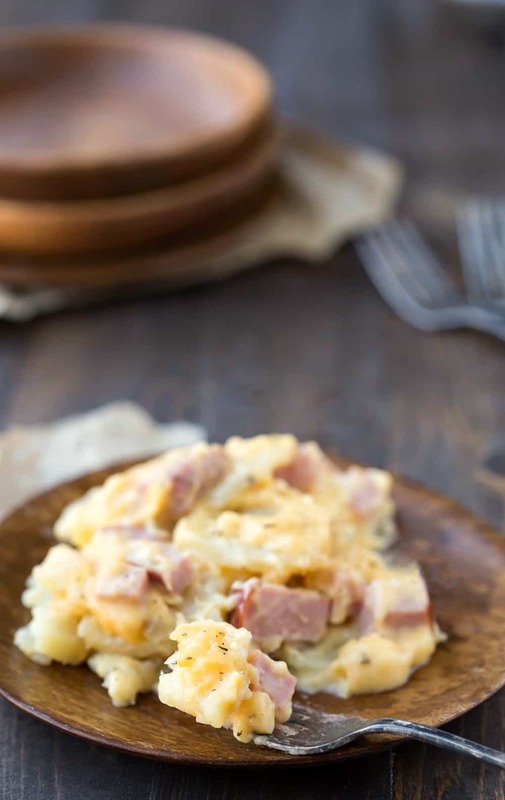 These Slow Cooker Scalloped Potatoes with Ham are the perfect way to do that! These cheesy potatoes are a yummy main dish. 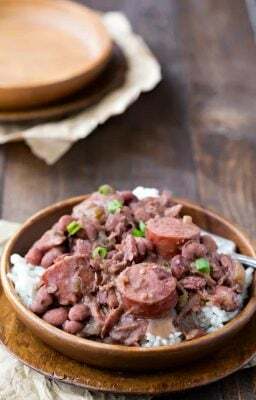 They take a little more work than a toss-and-go slow cooker meal, but it’s so worth it! If you are short on time, some of the prep (grating the cheese, cutting up the ham) can be done ahead of time. Line slow cooker with a foil collar against the back half of the cooker, and spray slow cooker insert with nonstick cooking spray. Microwave potatoes and 2 tablespoons milk in a covered bowl, stirring twice, for 6-8 minutes, or until almost tender. Uncover, and set aside to cool slightly. White the potatoes are in the microwave, melt butter in a large saucepan. Add garlic and thyme; cook for 30 seconds. Stir in remaining milk, broth, cornstarch, and pepper. Bring milk mixture to simmer, whisking constantly, until just thickened. Whisk in cheese, and stir until cheese has melted. Remove from heat. The sauce should be nice and pourable. If it's too thick, stir in additional chicken broth. Pour about 1/3 cheese mixture over the bottom of the slow cooker. Layer the potatoes in, overlapping as you go. 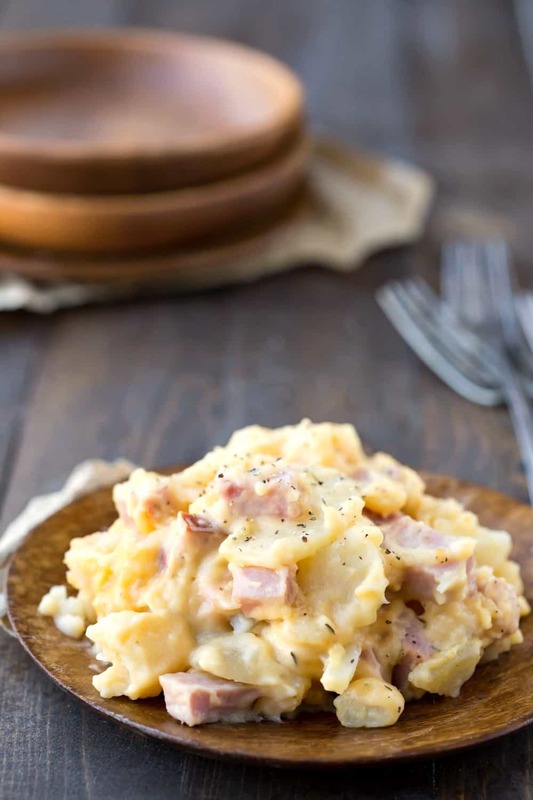 Top potatoes with diced ham. Pour cheese sauce over the top, spreading as necessary. Cover and cook until potatoes are tender, about 4-6 hours on low. 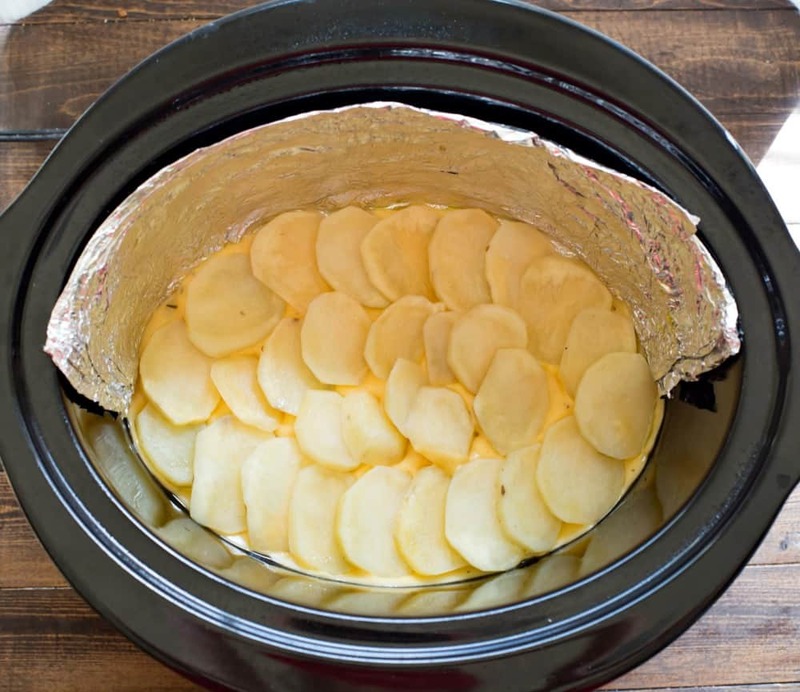 Remove foil collar, and let potatoes cool for 20 minutes before serving. *This recipe does not hold well on warm. **Nutrition facts have been estimated. 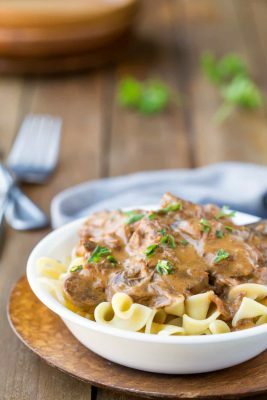 Adapted from America’s Test Kitchen Slow Cooker Revolution. Fantastic! I found this recipe when I was looking for a recipe to use leftover ham. It was gobbled up! I’ll make it again when I have leftover ham. Thanks! Make it a little quicker could frozen hash browns be used? Is the microwaving of the potatoes necessary if it so going to be cooking 4-6 hrs and they are cut? It helps to give the potatoes a head start. Low is only about 190F, so microwaving the potatoes helps to get them going. What is the purpose of the foil on 1/2 of the pot? Can a slow cooker bag be used instead? The foil collar helps distribute heat. Many slow cookers have a hot spot, and the foil collar helps to avoid over-cooked food in those areas. I haven’t tried this recipe with a slow cooker bag, but I think it’s a good idea. Can u cook on high 4 hours? I’ve never tried cooking it on high so, unfortunately, I can’t say for sure. I have a 2 qt. Crock pot and I was wondering if I can cut the recipe down to half? I haven’t tried this recipe with a 2 quart, so I’m not sure how well it will work. Can I make this the night before and assemble and then cook it in the crock pot the next day? I’ve never tried assembling it the night before. I’m not sure how the potatoes would hold up, but if you try it, I’d love to hear how it turns out. Good luck! Do you do a layer of potatoes then ham, etc. and repeat or is it only a single layer of each ingredient? Thank you! It’s just a layer of potatoes, then ham, and then cheese sauce. Please let me know if you have any other questions! Slightly worried that I might eat the entire batch of these before the guests even arrive– but hey, what’s life without a risk, right?! Seriously though, these look to. die. for. Hey, the guests will never know! ;) Thanks, Karly! They look good, I’ll give them a try. What is the point of the foil? Thanks! Most slow cookers have hot spots, and the foil helps the food to cook more evenly.